Calista Corporation is one of thirteen Alaska Native Regional Corporations created under the Alaska Native Claims Settlement Act of 1971 (ANCSA) in settlement of aboriginal land claims. Calista was incorporated in Alaska on June 12, 1972. 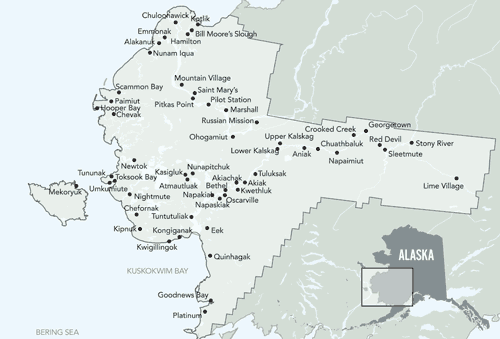 The Calista Region covers Alaska’s Bethel and Wade Hampton census areas and includes 48 permanent communities and eight seasonally occupied villages, located along the banks of the lower Yukon and the middle and lower Kuskokwim Rivers, Nunivak Island, and the Bering Sea coast from the mouth of the Yukon River, south to Cape Newenham. Although the Calista region is in western Alaska, Calista Corporation is headquartered in Anchorage, Alaska. Calista is a for-profit corporation with 17,300 Alaska Native shareholders primarily of Yup’ik descent. As part of ANCSA, Calista received patent for 4,997,263 acres (20,223.21 km2) from the federal government as well as approximately $80 million, making it the second largest corporation established under ANCSA. Because of to the importance of the land to the traditional subsistence economies of the region’s Yup’ik residents, including the bulk of Calista’s shareholders, Calista concentrated most of its land selections under ANCSA in the areas surrounding the region’s 56 villages. Under ANCSA, Calista Corporation also holds subsurface estate correlating to 6.2 million acres (25,000 km2) of surface lands selected by the 46 ANCSA village corporations in the Calista region. Calista’s own entitlement includes 238,000 acres (960 km2) of fee estate lands. Of the lands so far conveyed to the corporation, about half are in areas with high mineral potential or current mineral production. Sand, gravel, and quarry rock also form a significant portion of Calista’s subsurface estate. Calista is encouraging exploration for oil and natural gas resources in the region. In a land exchange with the federal government, finalized in 2001, some of Calista’s surface land parcels and a portion of its subsurface estate were incorporated into the Yukon Delta National Wildlife Refuge, while preserving subsistence hunting and fishing rights. Calista is also a land owner to subsurface rights from ANCSA, and holds title to the large Donlin Creek gold deposit, which is leased to Barrick Gold and NovaGold Resources. Key Calista businesses include oil well services, telecommunication and VoIP services, secure data hosting, cybersecurity, business services, equipment leasing, computer consulting, real estate, environmental consulting, construction, marketing and advertising. Chiulista Services, Inc. (CSI). Remote site services, food services, temporary employment services, government contracting. Solstice Advertising. Advertising and public relations services, including graphic design, web site development, marketing strategy, media buying, and print, interactive, and electronic media. Tunista, Inc. Headquartered in Anchorage. Construction, IT consulting services, base maintenance, facility management, and other service and technical support areas. Tunista Pacific Rim. Headquartered in Honolulu, Hawaii. Federal government/military small business 8(a) contracting and commercial/private section work throughout the Pacific Rim. Yulista Management Services, Inc. Headquartered in Anchorage. with Professional and technical services to government agencies, communities, and businesses throughout the U.S., including metrology, rapid prototyping and aerospace engineering, geochemical database design and conversion, and administrative services. Ookichista Drilling Services, Inc. Oil well servicing. 20% owner. Nordic-Calista Well Services, Inc. Joint venture with Nordic Well Servicing, Inc. to provide workover, completion and coil tubing services on the North Slope, Prudhoe Bay and Kuparuk. 20% interest. JVYS, 51% owned by YMS. Tunista Arctic Rim/TBI Construction LLC. Headquartered in Anchorage. Commercial, light industrial, multi-family, and Arctic construction, primarily in Alaska. 51% owned by Tunista, Inc.
Brice Sukakkpak, LLC. 50% ownership. At incorporation, Calista Corporation enrolled 13,303 Alaska Natives, each of whom received 100 shares of Calista stock. The total number of shareholders has fluctuated since due to transfers through inheritance and gifting of shares, but the total number of shares remain the same. As an ANCSA corporation, Calista Corporation has no publicly traded stock and its shares cannot legally be sold. Currently, Calista has almost 14,000 shareholders, almost all of whom are Central Alaskan Yup’ik people, and most of whom still speak the Yup’ik language and live a largely subsistence lifestyle of hunting, fishing, and gathering. All 56 of the Region’s communities are organized into 45 for-profit ANCSA village corporations, each receiving ANCSA surface estate land entitlements. The village corporations for the communities of Kalskag, Lower Kalskag, Aniak, Chuathbaluk, Napaimute, Crooked Creek, Georgetown, Red Devil, Sleetmute and Stony River merged to form The Kuskokwim Corporation. The village corporations for Nightmute and Umkumiute merged to form Chinuruk, Incorporated. Gold Creek/Susitna Gold Creek/Susitna Native Assoc.